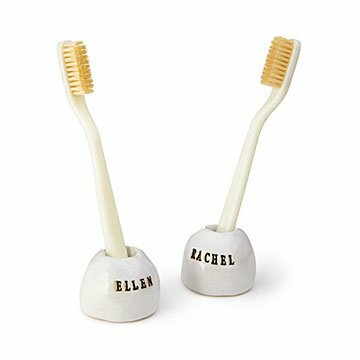 Up your bathroom decor game with a pair of made-for-you toothbrush holders. It's time to let go of the plastic cup you've been keeping your toothbrushes in all these years. Gitti Lindner has something much cuter on deck: a dynamic duo of handmade holders stamped with the text of your choice. Finished with a bright white glaze, they're just the right size for standard brushes (or small electric ones, if that's your thing). Ideal for couples, families, or best friends-turned-roommates. Handmade in California. 1.5" H x 1.5" dia. each; opening is .75"
This is a made-to-order item. If you order today your item will ship no later than 5/7/2019. We do use these as toothbrush holders. What a subtle reminder of how special we are to one another!